"Clustering-Based Robot Navigation and Control" by Omur Arslan, Dan P. Guralnik et al. In robotics, it is essential to model and understand the topologies of configuration spaces in order to design provably correct motion planners. 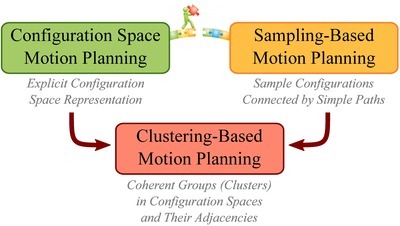 The common practice in motion planning for modelling configuration spaces requires either a global, explicit representation of a configuration space in terms of standard geometric and topological models, or an asymptotically dense collection of sample configurations connected by simple paths. In this short note, we present an overview of our recent results that utilize clustering for closing the gap between these two complementary approaches. Traditionally an unsupervised learning method, clustering offers automated tools to discover hidden intrinsic structures in generally complex-shaped and high-dimensional configuration spaces of robotic systems. We demonstrate some potential applications of such clustering tools to the problem of feedback motion planning and control. In particular, we briefly present our use of hierarchical clustering for provably correct, computationally efficient coordinated multirobot motion design, and we briefly describe how robot-centric Voronoi diagrams can be used for provably correct safe robot navigation in forest-like cluttered environments, and for provably correct collision-free coverage and congestion control of heterogeneous disk-shaped robots. This work was supported in part by AFOSR under the CHASE MURI FA9550–10–1−0567.